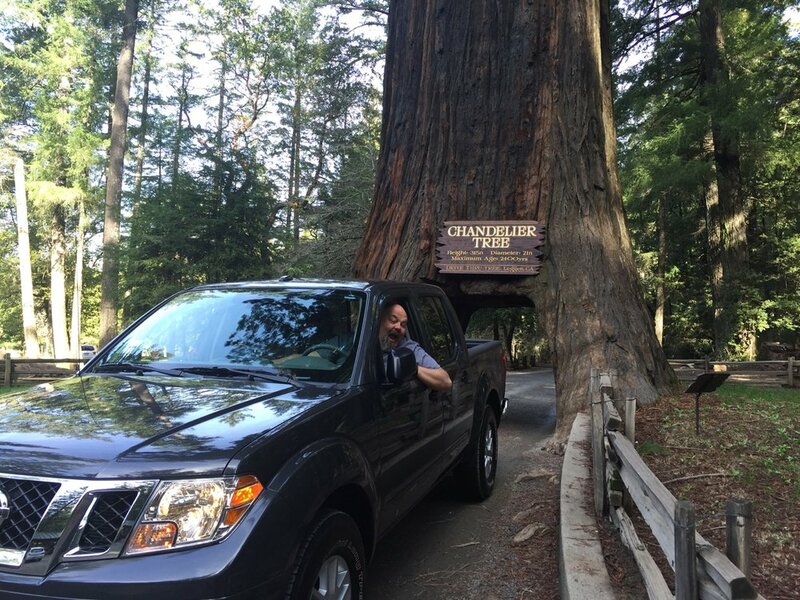 With rumors of its demise being greatly exaggerated the Drive-Through tree in Leggett, California is still standing tall and accepting motorists who come from near and far to drive through the ancient Redwood tree. This is one of my favorite destinations just because it’s your typical vintage roadside attraction with signs inviting you to experience the drive-through tree posted miles before and building up curiosity with travelers and the kids who demand to see it from the back seat. As with many roadside attractions that I’ve enjoyed, this one furthers the suspense as you drive amongst the ancient trees that shadow the dirt road and then you see it - the actual drive-through tree. I’ve never been there when there isn’t some commotion around the hole in the tree with either cars, pedestrians, motorcycles or even pets making their way through the opening. One can’t help but look up as you wonder about the health of the ancient Redwood and you’ll see that it’s a bit hollow up there. Clearly these trees can survive with the centers cut out. According to the attraction’s website the huge hole in the plant actually hasn’t done much to shorten its life as these Sequoia semperviren trees actually don’t have a tap root, but rather, they have thousands of roots that spread out from the base of the tree. These roots intertwine with those of neighboring trees. Estimates put the Chandelier Tree, named for the chandelier-style branches at the top, at about 2,000 years old. Coastal redwoods actually survive with a thin layer of Cambrian just under the bark which is where the growth of the tree actually takes place and serves as the pipeline where water is brought up from the roots. Lastly heartwood is what’s in the center of the tree and this is basically dead wood so having huge chunks taken out of it aren’t that unusual in nature, though Mother Nature isn’t hacking holes you can drive Escalades through. But various forces of nature like lightning can create holes in the center of the trees. Elsewhere in Northern California the “Tunnel Tree” in Calaveras Big Tree State Park was felled by a storm which is why people have asked if this tree is still standing. It is. The hole story, as it were, started in the Great Depression with a hole being cut so people could drive through at Coolidge Park. As time marched on and cars became larger that tree couldn’t accommodate the newer, larger vehicles so the Chandelier Tree was cut and is the tree we still drive through today. It is estimated that the Chandelier Tree is over 300 feet tall and almost 66 feet in circumference and has been watching people drive through it since about 1938. 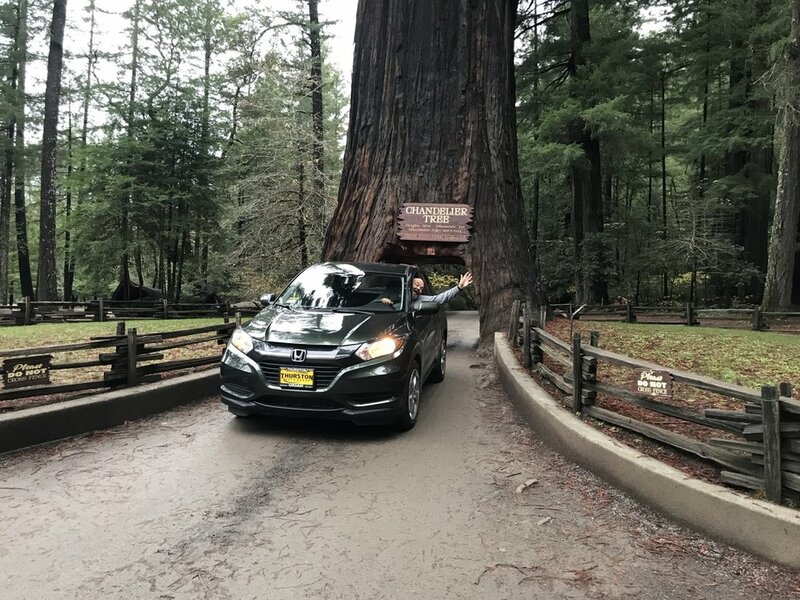 It’s a lot more fun to drive through the tree than you can imagine and I’ve brought visitors from Europe and all points east, all of whom have enjoyed their experience here. I always take the new cars through the drive-through tree. The trees can survive with a great hunk of the middle out. 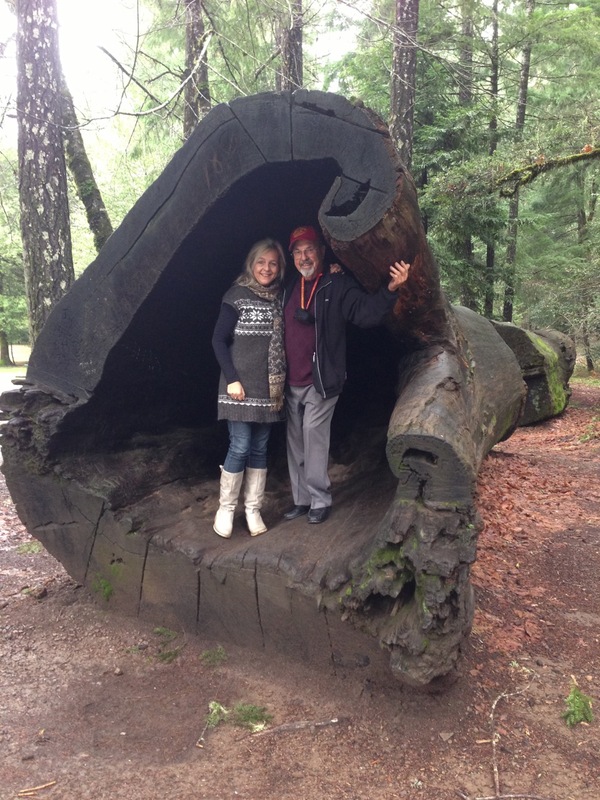 Here my nieces stand in the hollow portion of a downed Redwood. My dad and cousin from Germany. 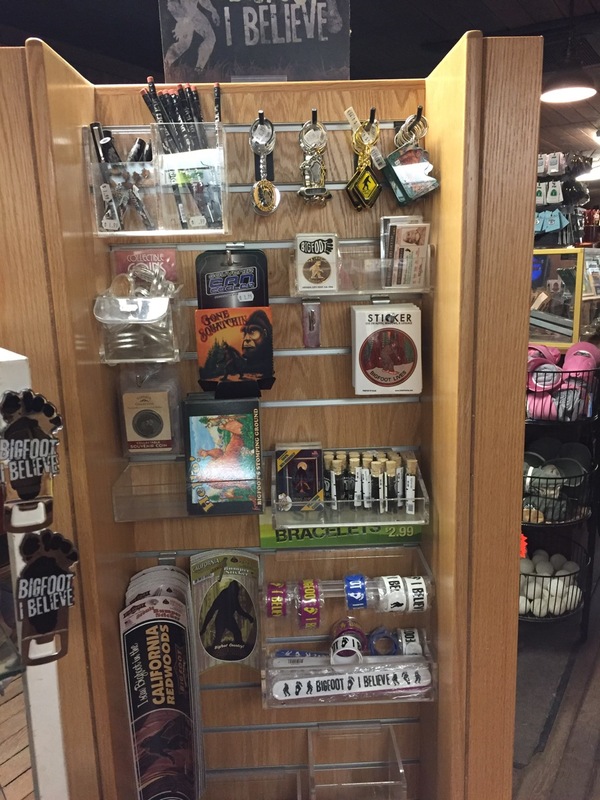 The gift shop has plenty of goodies for all tastes. You never know whom you’ll run into or what they’ll be driving. Around the tree itself are plenty of living Redwood Trees as well as a number of dead ones. Some of these have natural holes or hollow cores that are so large you can stand in them. There’s also a gift shop with lots of items inspired by the Redwoods that are around along with other souvenirs, many of which I have somewhere here in the house. 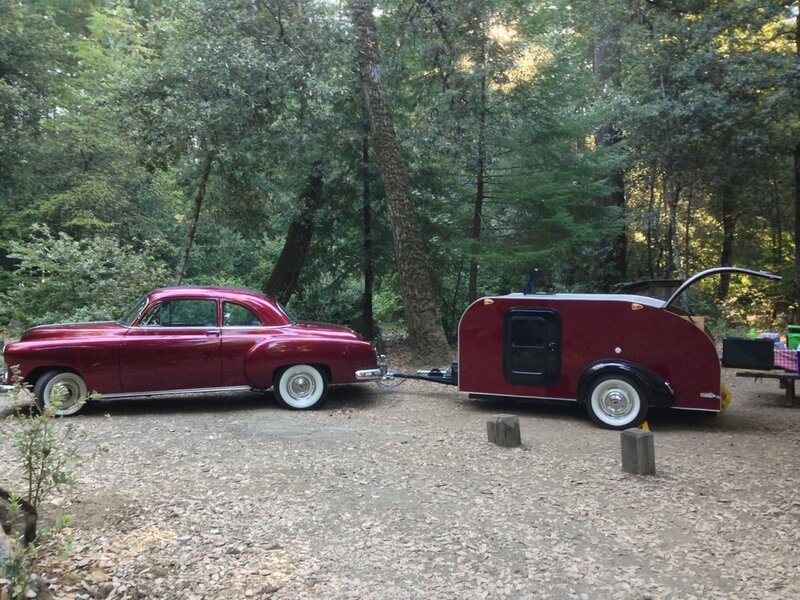 If you find yourself in Northern California doing a bit of StressLess Camping you really should pay a visit to Leggett and point the nose of your vehicle through the drive through tree. 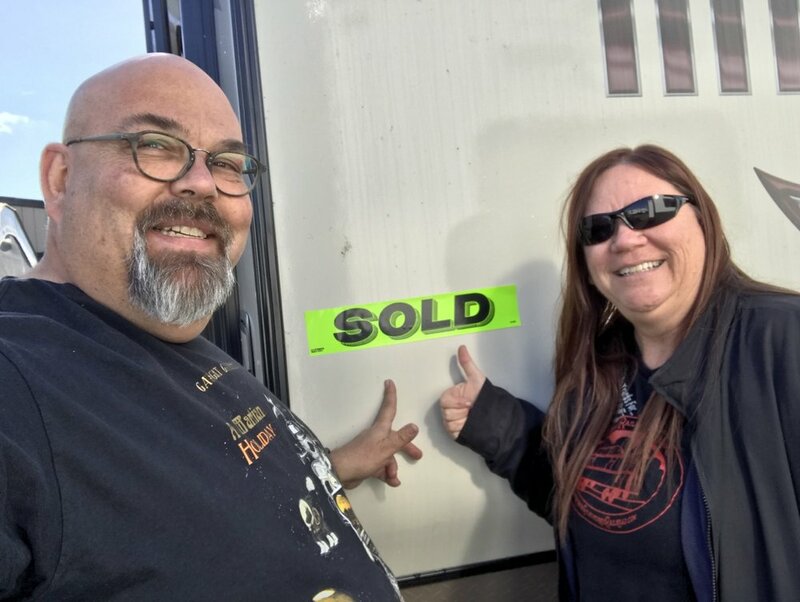 I know I’ve taken every vehicle I’ve purchased through the thing along with many many friends and family members. After all, who doesn’t love a good roadside attraction, especially on that was probably around when Christ walked the earth.